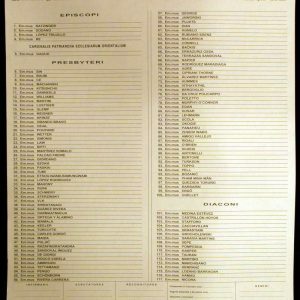 These very rare and historic documents are the ballot paper and scrutiny sheet from the second vote of the 1903 Conclave that eventually elected Giuseppe Sarto, Patriarch of Venice, as Pope. They belonged to Cardinal Domenico Svampa, Archbishop of Bologna, and are documents that should not exist: they should have been burned, like all the others from that conclave were. Ballot papers are used by each cardinal to vote for a prospective candidate until someone receives a majority of votes to qualify. Scrutiny sheets are used by each cardinal to tally votes, thereby keeping track of the progress of individual cardinals. 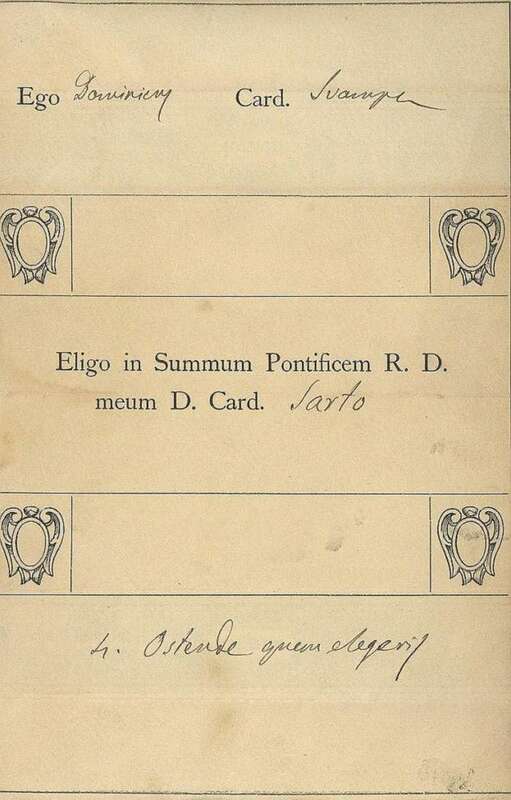 Annotations in ink show that Cardinal Rampolla was the clear favorite after the second vote, and Cardinal Sarto was way behind. The scrutiny sheet is 24 by 21.5 inches. 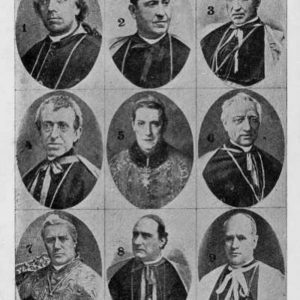 In addition to naming all cardinals present at this second vote, it also gives the hand-written names of the nine cardinals who acted as infirmarii, that is, those who collected ballots from sick and infirm cardinals, and scrutatores, the official counters, and recognitores, those who verified the count of each vote. The second document is an actual ballot paper, 7.5 by 4.9 inches. 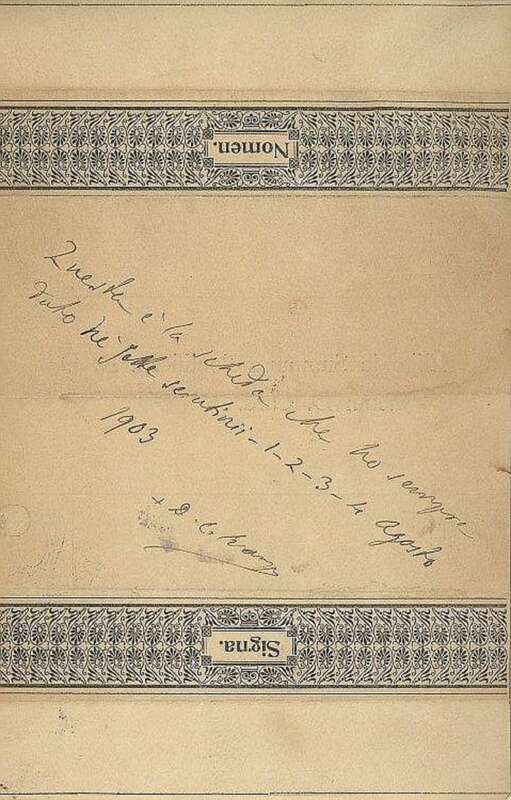 It is signed by Cardinal Domenico Svampa, the Archbishop of Bologna. 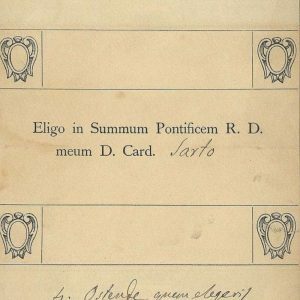 The front of the ballot shows his vote for Cardinal Sarto; on the back, presumably to make the point that he was not swayed by the political interference at the time of this vote, he wrote, This is the vote I’ve always given in the seven ballots of August 1-2-3-4, 1903. 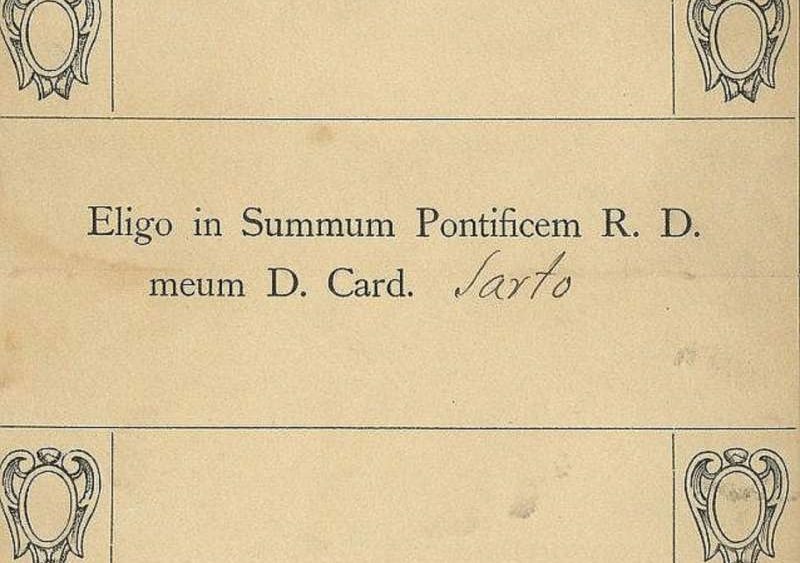 Sarto, Rampolla and Svampa, as can be seen on the Papabili item included with these documents, were all considered to be strong candidates at the 1903 Conclave. 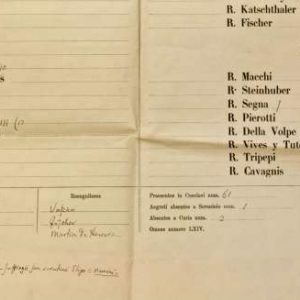 According to Father Kunst, this was a very important vote (of the conclave) because it was the last vote before the veto actually boycotted Cardinal Rampolla, paving the way for Cardinal Sarto to be the candidate. So it was a history-changing vote. It was not just any vote of the election; it was the most impressive one. While any of these scrutiny sheets from that conclave would be impressive, this one is the most impressive of all. The scrutiny sheet from this second vote is proof of Cardinal Rampolla’s significant lead. It is not known how the two documents came to survive; they should have been burned with all the other ballot papers to produce the traditional black or white smoke. They came from the family of a noted Italian journalist with numerous relations and contacts within the high ranks of the Church. 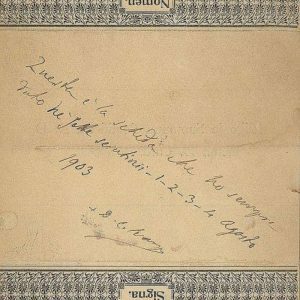 These documents are among the most historic and rare items in the Papal Artifacts’ (or in any other) Collection. The items you see displayed here were smuggled out of the Conclave. 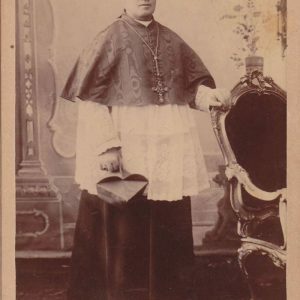 They confirm that Saint Pius X was not in a position to become Pope until his rival, Cardinal Rampolla, was eliminated using a centuries-old royal veto power. It was this political interference, now a long-forgotten part of ecclesiastical law, which allowed his election. 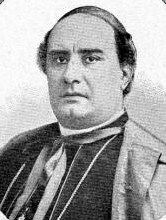 The most popular candidate, Mariano Rampolla del Tindaro, Secretary of State to Pope Leo XIII, was the leading candidate. He was blocked by the Austro-Hungarian Emperor, Franz Joseph, through powers known as the Jus exclusivae, which allowed a select group of Roman Catholic monarchs to veto any would-be pope of whom they disapproved. And Franz Joseph disapproved of Rampolla, who, by coincidence, was serving as the scrutineer, charged with reading aloud the votes after the first ballot on August 1. His popularity wasn’t the big surprise of that vote; rather, it was the lack of support for another candidate who it was suspected would take the lead. Everyone assumed that Rampolla would be the next Pope after the first ballot. He had the support of both French and Spanish cardinals as well as many Italians. 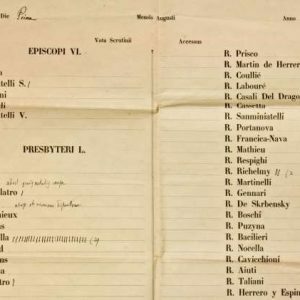 After the conclave, a French cardinal, in violation of the proceedings, published a lament, saying, Where would we have found a better candidate than the intimate confidant of the great Leo XIII, the devoted collaborator of his great projects? 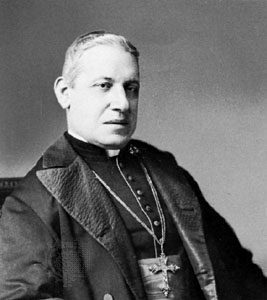 That, however, was not the opinion of the German bloc since they judged him as too progressive in his politics, as too great an advocate of social justice (referring to the encyclical, Rerum Novarum) and too close to the French with too much hostility towards the German and Austria-Hungarian empires. 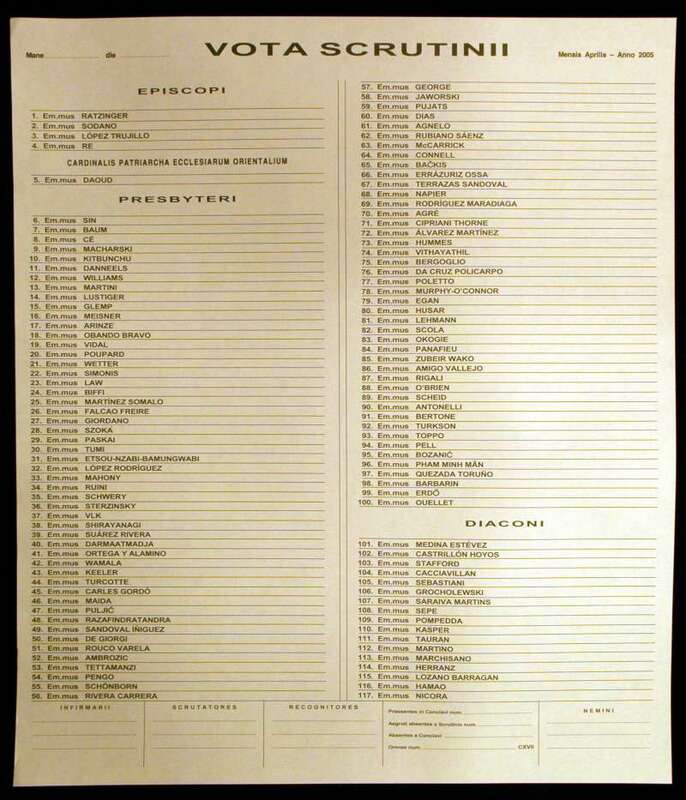 In the second ballot of the conclave, from which these documents come, both Rampolla and Sarto picked up many votes that put them in the lead. Rampolla, as can be seen on the scrutiny sheet, needed only 13 more votes to be elected. Considered a mortal enemy of Austria and an unfavorable friend of the Germans, this group of cardinals decided to consider Sarto, the Patriarch of Venice, as their candidate. 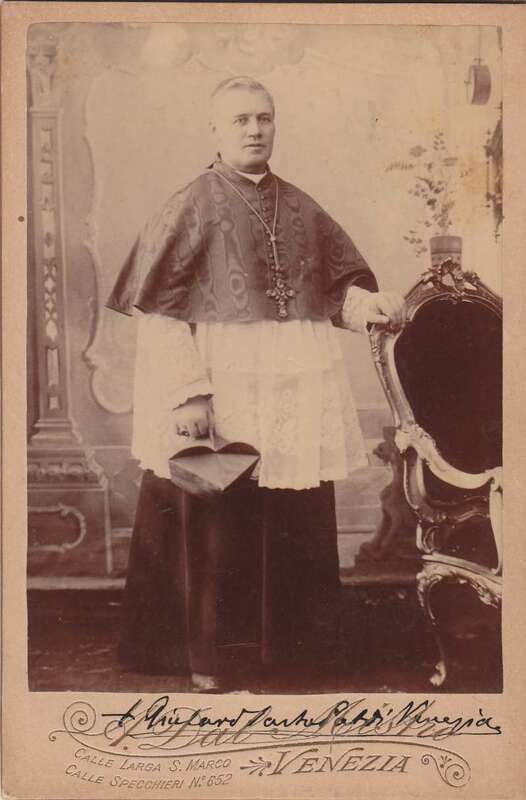 It is interesting that the cardinal from Austria-Hungary refused to carry out the order from Franz Joseph to veto Rampolla, and so it was left to the primate of Cracow, Poland, to read the declaration of the veto to the assembled cardinals. They were outraged by the interference of Franz Joseph. But it lead to Cardinal Rampolla’s finest hour. It is an affront to the dignity of the Sacred College by a lay power, but with regard to my humble person, I declare that nothing could be more honorable, nothing more agreeable could have happened(than electing Cardinal Sarto). 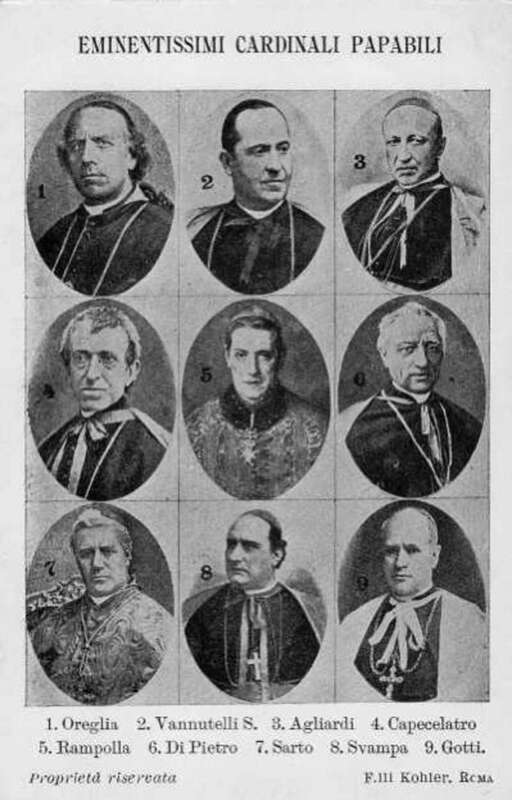 The procedure, used only a handful of times in history, originating in the 1600s, allowed a king or queen of Spain, France or the Holy Roman or Austro-Hungarian emperor, to nominate one of the cardinals in advance of the conclave to exercise their veto with instructions to step in if someone to whom they objected was about to be elected. Although Sarto benefited from the move, as it enabled him to become Pope, there was outrage at the interference, and he personally abolished the Jus exclusivae. 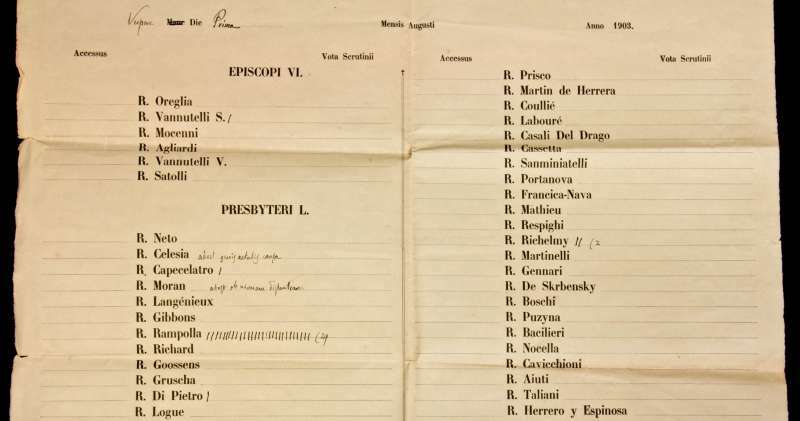 As can be seen in the photographs, this hand-written tally from the second round of voting shows Rampolla having already secured the support of 29 of the 61 cardinals present in the Sistine Chapel—just short of a majority. Sarto had only 10 votes at this point. After Rampolla was vetoed, Sarto, amid terrible personal angst, went on to be elected Pope in the 7th round of voting. Why Franz Joseph objected to Rampolla is not certain, but according to Father Kunst, Franz Josef most likely vetoed the Cardinal because of his refusal to bury the Emperor’s son years earlier. His son had taken his own life, and although it is not known for certain, many historians believe this was the main reason. Conclave rules ban Cardinals from revealing details of the ballot, which is why the papers are burned when the new pope has been elected. But these papers were retained by Cardinal Svampa, himself one of the papabili of this conclave. It is presumed he kept these papers showing that his vote for Sarto was not a second choice, in obedience to the imperial veto, but was a decision he had made himself from the very beginning of the conclave. I think one of the reasons why the scrutiny was saved by Svampa was because he knew of the historical import of this vote. One can imagine him quickly folding the scrutiny while the letter of veto was being read. Though this is my speculation it seems to me to be most plausible. The story of these documents is part of the living history of the papacy. They are considered to be the most historic items in the Papal Artifacts’ Collection and among the most favorite of the Papal Artifacts’ Curator.